Cathedral Park Music is taking a road trip this Spring Break, all the way across the Atlantic to what is widely regarded as the music capital of Europe, VIENNA! This is the chance of a lifetime for Cristina and she is planning to take full advantage of her 10 day whirlwind tour of the city. 10 shows in 10 nights! That’s right, 10 shows in 10 nights including orchestras, the Vienna’s Children’s Choir, operas, string quartets, vocal recitals. Cristina’s utmost goal on this trip is to absorb and bring back the inspiration and learning to her students in our St. Johns community. This Blog will provide Cathedral Park Music followers with some of the highlights of the trip and comments on all of the events that Cristina attends. Please send us your comments and your insights as we try to capture just a slice of Viennese life for our Portland family. Mr. Beethoven, Cristina. Cristina, Mr. Beethoven. 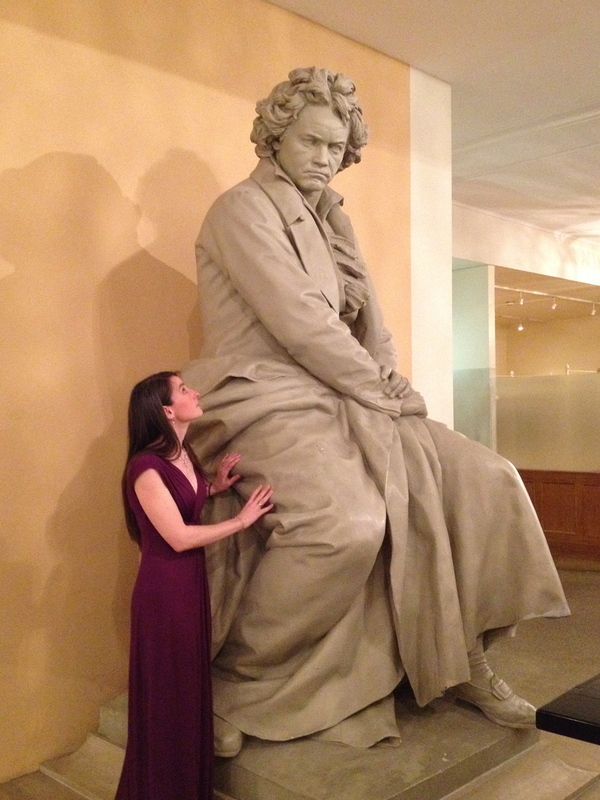 Pleased to meet you, Mr. Beethoven! As you can see from the photo, the stage resembled an art installation piece. The pianist played on a Bosendorfer, and for those unfamiliar with pianos, Ignaz Bosendorfer was an Austrian piano maker from 1828. 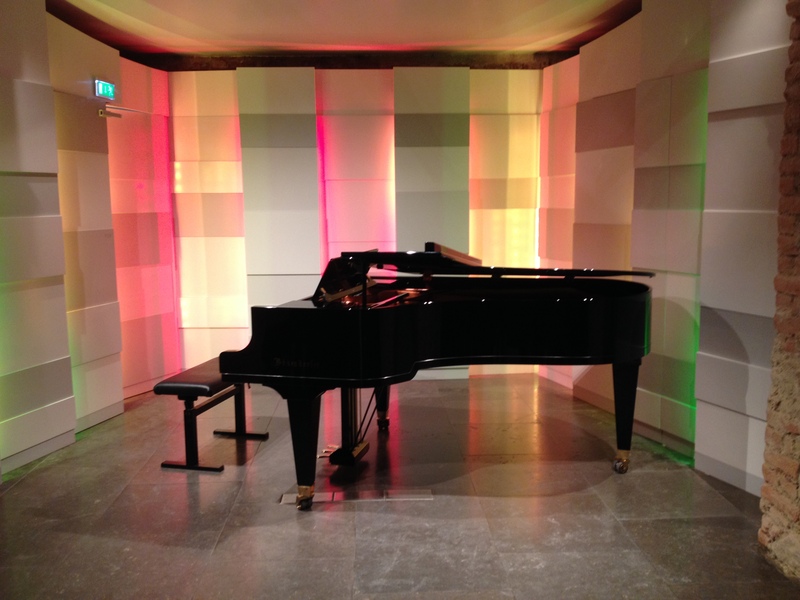 These pianos are often compared with Steinway, and acclaimed for their dark and rich tone. The vocalist was Mariana Garci-Crespo, a coloratura soprano with a crystalline quality and a full sound that more than filled the intimate space. Her program consisted of a repertoire of art song and arias. The highlights were Schubert Lieder, a vocalise by Camille Saint-Saens, and an art song by Mexican composer, Angela Peralta. Particularly impressive was her interpretation of Richard Strauss’ Zerbinetta’s aria from Ariadne Aufnaxos. The space truly inspired me to continue the tradition of art song and vocal chamber music and bring it to St. Johns in the near future. This chamber opera was performed in a concert format (it was not staged) by Wiener KammerOrchesters and world class singers. The performance was moving, extremely emotional. In “The Turn of the Screw” Britten took on sensitive and uncomfortable subject matters, child and sexual abuse. Particularly notable was the boy soprano who sang the role of Miles. At only 13 years old, his voice was pure, unwavering, and at times haunting. The recurring theme of the composition will stay with me. It was simple, but it was weaved in and out of vocal and orchestral complexities. It was imbued with harmony and dissonance. The format of the performance only heightened my desire to experience the staged version. I can only imagine the impact it would have to see the performers completely immersed in character. There is nothing light about this opera. It is a dark story that delves deep into the souls of disturbed characters. All of them caught in a tangled web of deceit. We encounter ghosts, not of the kind we would care to have as visitors in our own lives. The parts of the whole were restive and uneasy, but somehow came together to form a masterful mid-20th century work that left me with admiration for Britten and the performers who took on this complex work. 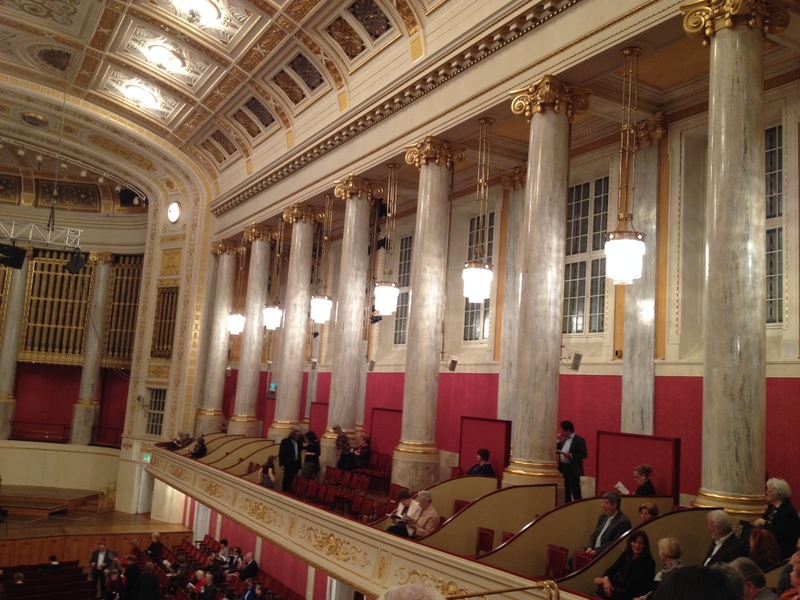 A thrilling night at the symphony where we had the privilege of being seated in the grosser saal (large salon). 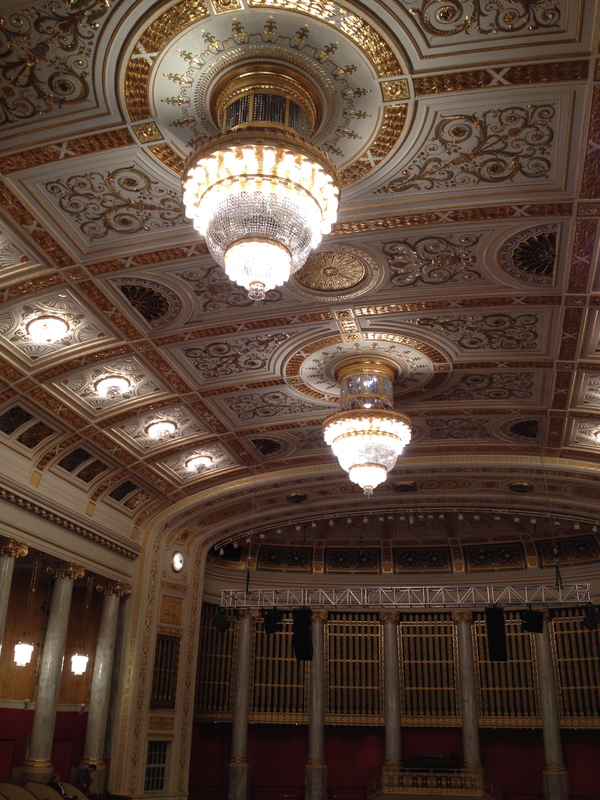 Musikverein has 3 salons in the building and three performances could be held simultaneously. The ornamentation throughout the building is breathtaking and is nothing less than a work of art. In Weber’s Overture, it was exhilarating hearing the big sound from the orchestra, specifically the horns signaling the hunt. The Overture is not merely a peek into the recurring themes of the opera, Der Freischütz, but it is an actual symphonic movement in it’s own right. Der Freischütz is widely regarded as the work that established German romantic opera. It was a treat to hear beautifully sung Schubert. Carolyn Sampson’s interpretation was sensitive, I could feel the loneliness reflected in her voice. An air of melancholy hung over the salon and the audience was held captive by her interpretation. Hearing Egon Wellesz was a first for me and quite a discovery. I was told he has written a great number of works for voice that I am looking forward to exploring. The evening was capped off by his rousing Symphony No. 3 which sent us into the Viennese night on our own personal hunt for chocolate tort and a dark espresso to sustain our buzz.